Turn on the radio, visit any shopping place, and you might be misled into believing that the Christmas season has already begun. Christmas music and decorations assault us throughout our shopping and preparations. However, the official Christmas season does not formally begin until the first Mass celebrated on Christmas Eve. Ironically, when the retail world deems Christmas over, on December 26, it’s really just beginning! The formal Christmas season continues through the Epiphany on January 6. Yesterday Catholics celebrated our New Years Day, the beginning of the new liturgical year, with new missals, new songbooks, and new readings. This season that kicks off our year is called Advent and it’s a very special time where we prepare our souls for the coming of Jesus. Remember when you were a child how the anticipation of an event thrilled you. You couldn't concentrate on anythine other than what was coming - a birthday, a vacation, some exciting event? You went over what it was going to be like contantly in your mind. This is Advent, focusing on Christ's approaching birth to save the world. When retailers attempt to force the Christmas joy upon us earlier each year, we risk losing that growing anticipation, the time when we are called to keep watch, to leave behind our sinful ways, to prepare ourselves, spirit and soul, for the arrival of our Lord and Savior. He will be our light shining through the darkness of our befuddled and self-serving world. Since circles have no beginning and no end, the circular shape of the Advent Wreath is used to symbolize God the Father and eternal life. The wreath holds four candles which are lit over the four weeks of Advent. There are three violet (purple) candles and one rose candle, each representing 1,000 years. Added together, the four candles symbolize the 4,000 years that humanity waited for the Savior. Violet is a liturgical color used to signify a time of penance, sacrifice, and prayer. During the first, second, and the fourth weeks of Advent we light violet candles. The Third Sunday of Advent is called Gaudete (Rejoice) Sunday. On this day we celebrate that our waiting for Christmas is almost over. Rose is a liturgical color used to signify joy, so we light the rose candle on the third Sunday of Advent. Traditionally, each of the four candles on an Advent wreath has their own meaning. 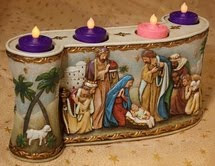 The first Sunday of Advent symbolizes Hope with the Prophet's Candle reminding us that Jesus is coming. The second Sunday of Advent symbolizes Faith with the Bethlehem Candle reminding us of Mary and Joseph's journey to Bethlehem. The third Sunday of Advent symbolizes Joy with the Shepherd's Candle reminding us of the Joy the world experienced at the coming birth of Jesus. The fourth Sunday symbolizes Peace with the Angel's Candle reminding us of the message of the angels: "Peace on Earth, Good Will Toward Men." It's not too late to start the tradition of the Advent Wreath in your own home. There are so many beautiful wreaths to choose from and dozens of Advent prayer books. Or you can simply display three violet and one rose candles on your table, taking the time each Sunday to light them in order and prayerfully meditate on the excitment that Christ is Coming!